Kidnap - An alternative use for the HOT103 Cockatrice 15mm monster! 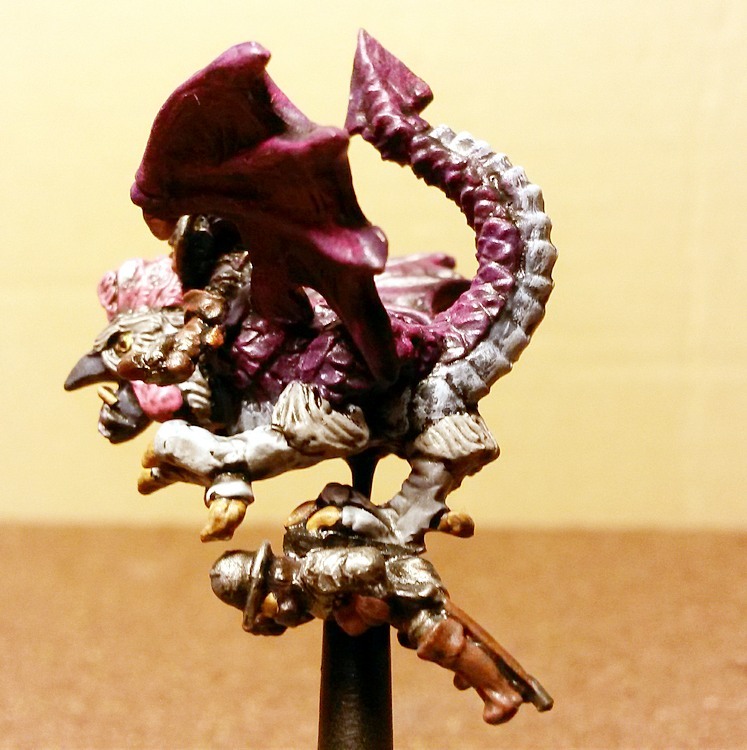 Some of you may have read my earlier article about painting the new Cockatrice that has joined the excellent 15mm.co.uk HOT range of figures. By strange coincidence Sam Croes and I both painted the new figure using similar colours despite being separated by a few hundred miles! I was therefore determined to paint another and come up with a very different colour scheme so Gavin very generously provided another casting for me to use. 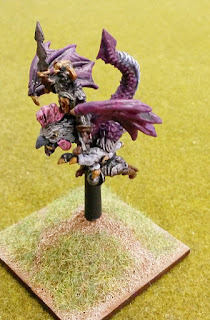 At the same time I was planning a big fantasy game and needed a general to lead my combined forces of evil, so I decided that the Cockatrice would make an excellent mount. 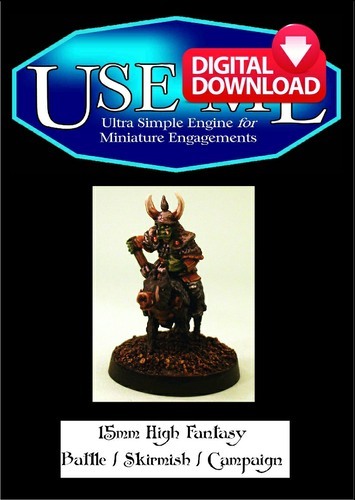 After much consideration I picked the mounted Chaos Knight figure from the Tabletop fantasy range (537 Chaos Knight on mount) to be my General. This was because the figure has a full helm so could be male or female, human or Vampire and could be used to fit various scenarios. In my game it was a Vampire Lord who had control of a Goblin tribe to fight alongside his Undead forces but as I've said before the only limit is your imagination. I clipped off the spear that the figure holds and replaced it with the sword from the Undead Cavalry standard bearer (HOT24) to make it different from my other Chaos Knights. To make the figure stand out further I decided to portray it as in flight as the Cockatrice already has it's wings spread. I carefully clipped off the base and used a flying stand (from the LBA1 pack) that was attached to the Cockatrice with a thin brass rod. 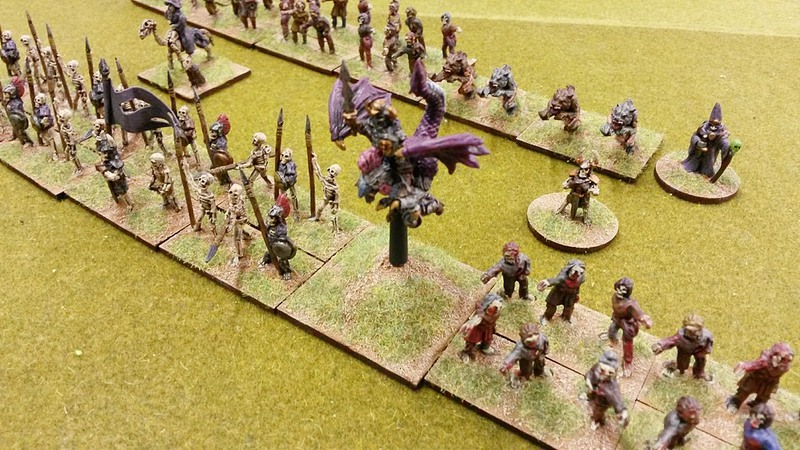 The flying stand itself was then attached to a 40mm square base to give it stability. As the bulk of my forces of good are human I decided to put a human command figure in the creatures claws to look like an enemy leader has been kidnapped for questioning. I used the command figure from pack MRC26 of the Altuos historical range as the majority of my humans are also from that range. For this Cockatrice I painted the scales in purple with a light blue underbelly and legs, then the feathers were coloured a light grey with the crests on the head in a vivid pink. The whole thing was given a black ink wash to tone it down so that it fit in with my Undead army but as the Chaos knight is mostly encased in metal, pretty much any colour would work. I enjoyed this project as it's fun to spend a bit longer on your leader figures to make them stand out on the tabletop. 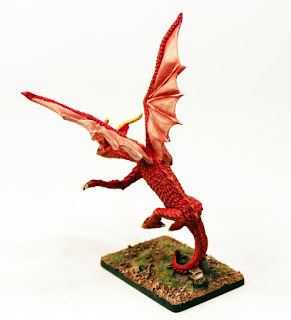 I know that the colour scheme won't be to everyone's taste but you have to agree that it's very different to the last Cockatrice that I painted. 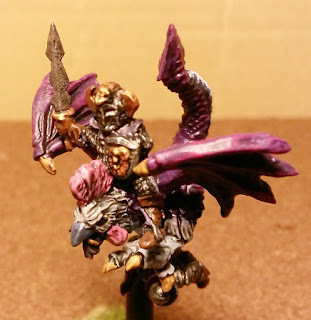 I have a growing collection of characters with monsters as mounts and they are always fun to do. 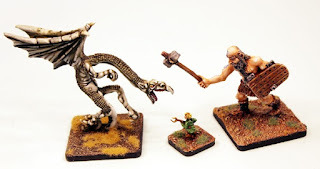 While I like having a good size collection of generic monsters that will fit with pretty much any army, it's good to tie some to a specific force as for me it helps to give the army an identity. Here is the HOT103 Cockatrice as it appears on the 15mm.co.uk website. It is a three piece white metal monster. Recently the lads at 15mm.co.uk released digital downloads of Age of Might and Steel and UM002 USEME 15mm Fantasy. These are excellent compact rule systems check them out! 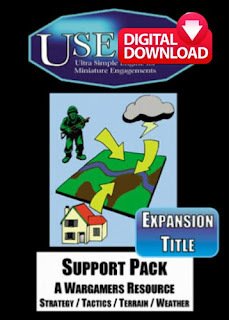 My beloved USEME Series of wargame rules is now digital downloads! Following on from HOF Fire Team and Age of Might and Steel but proceeding the mighty Alien Squad Leader we at 15mm.co.uk are proud to announce that the dozen titles in the 'Ultra Simple Engine for Miniature Engagements' USEME series are now digital downloads. At just 3.00GBP each you get the book, the covers and an 'ease print' version for home printing with all the non-text and vital graphics removed. 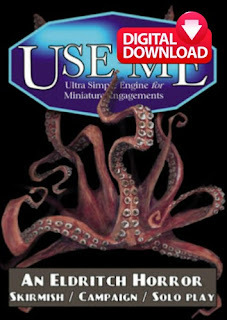 We no longer have all of the A6 pocket print booklets of USEME in stock but what we have is on the website. You can see them all HERE. 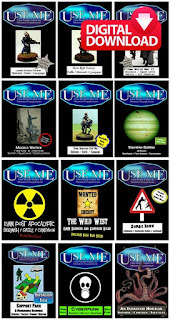 USEME as a series has sold more than seven thousand copies and to me, as its lead author and creator, it makes me so happy that the little set of rules I developed for playing with my then eight year old son has given wargaming fun to players all over the world ever since. 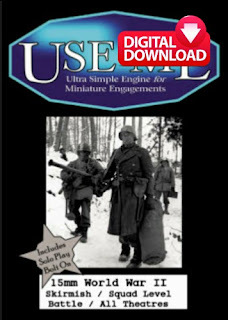 Firstly as booklets and then as downloads and now as digital books on the 15mm.co.uk website. 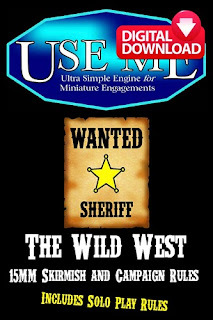 If you are short of time or want something to plug in and play in ten minutes to an hour then USEME is for you. 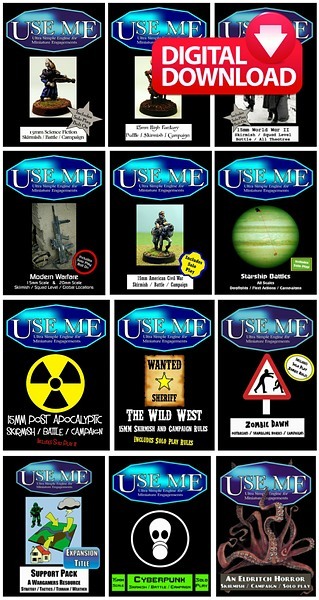 Science Fiction, High Fantasy, World War Two, Modern Warfare, American Civil War, Starship Battles, Post Apocalypse, Wild West, Zombie Dawn, Cyberpunk as well as Eldrich Horror and the fantastic Support Pack that works with the other titles. Here is a list of the titles and a link to each. We also have two Complete USEME Games containing book, miniatures and scenarios too. Each page linked to has all the information you need as I want to keep this article short enough for sanity! 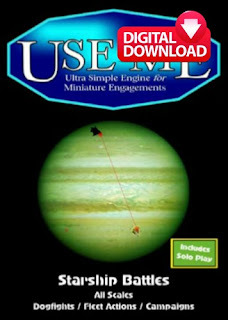 Though there have been no new USEME titles published in two years or so there are a half dozen titles in the works from several authors. 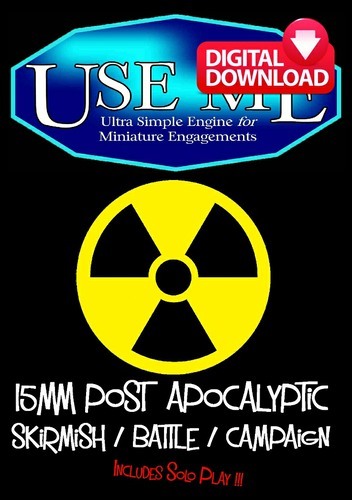 It is my intention to get these out to wargamers as digital downloads. More on this at the time of course but the nearest to ready are about Gangsters and a Modern Warfare Setting title plus of course my own Alien Safari. 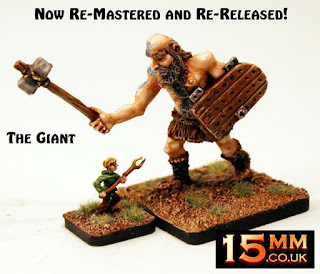 HOT7 Giant returns and completes our classic resin project! I want to thank everyone for the fantastically positive response to the re-mastering and re-release of the mighty HOT37 Destroyer of Hope grand dragon this month. We now complete the classic resin project which saw a half dozen 15mm HOT and Tabletop range monsters taken out of white metal production and entered into resin production with the HOT7 Giant of which thousands have seen gaming tables worldwide. It is online now with 15% off until the end of the month. Go HERE or read on. One of the earliest codes in the HOT 15mm Fantasy range the Giant serves well in armies of Humans, Dwarves, Orcs and many more. Here are the details. 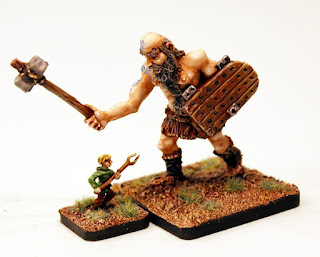 Here are some other pictures of the Giant shown with other miniatures and items from our ranges to give you a sense of its scale and use in 15mm wargaming. Go HERE. We have many other monsters and creatures in the HOT 15mm Fantasy Range which you can see on a specialised site search by clicking HERE. Thank you for your support in this project and for the kind words sent our way. From now until the end of Monday 17th 2016 we are automatically including a free Norman NC6 Cavalry Command Set (3 miniatures worth 1.80GBP) containing a General, an Officer and a Standard Bearer to celebrate the 950th Anniversary of the Battle of Hastings fought on this day in 1066. 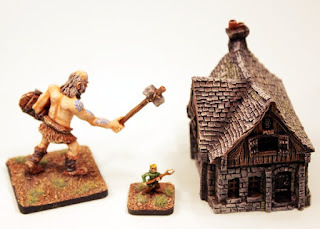 To get this free set of miniatures all you need do is place an order of any size within this period for any Norman (N or NC) or Saxon (SA or SAC) code, even one miniature, and we automatically will do the rest for you. You can learn more about the battle HERE and if you want to go straight to our 15mm Normans click HERE and our 15mm Saxons click HERE. Otherwise please read on. 15mm.co.uk has a large range of Dark Age historical miniatures in the Isarus pages of the website. All of these miniatures can be purchased as single castings. There are fifteen categories including Byzantines and Arabs and Mongols but today we are celebrating the two sides at Hastings. The Normans and the Saxons. 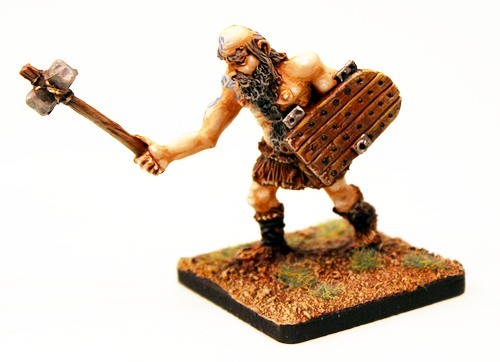 There are fifteen different codes in this part of the Isarus range including Archers, Spearmen, Crossbow, Knights and Retainers as well as command on foot and mounted. See them HERE. 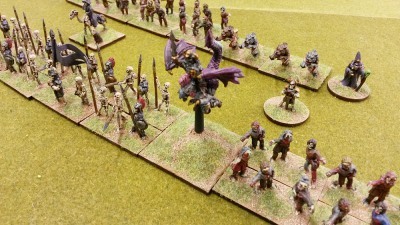 There are twelve different codes in this part of the Isarus range including Huscarl, Thegns, Fyrds as well as warriors and cavalry plus command. See them all HERE. Additionally if you would prefer a Saxon Cavalry Command Set (SAC1) with two miniatures worth 1.20GBP instead of the Norman one just email us with your order number to sales@15mm.co.uk and we will do that for you. 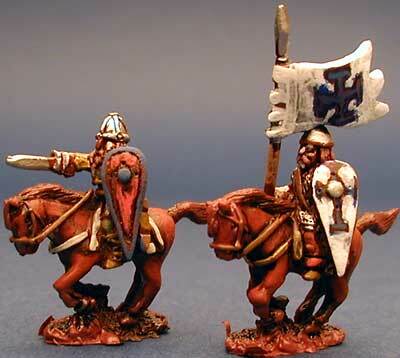 15mm.co.uk currently has two pro-painted but not based 15mm historical armies in stock. You can see these on the website HERE. 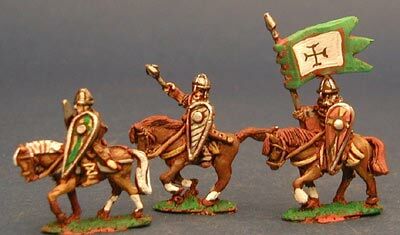 We have a Norman Army of 127 pieces and a Saxon Army of 230 pieces and these are at a great price. We will base these to any system you like and it is first come first served as we have only one of each in stock. You get a further discount if you purchase both of them. If you have any questions please email sales@15mm.co.uk and ask. 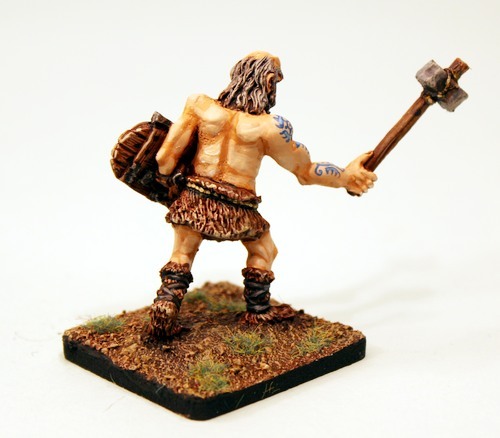 Order up and send your basing requirements and the name of your chosen rule set to us with the order number. This is a great deal to get you on the table in one step and delivery is free worldwide. Apologies if this has been sold by the time you click through, if you would like a painted quote email and ask us and we are happy to assist you. Godwinson or William either way it was a hell of a fight! Thanks for taking the time to come to this article for this is a first for 15mm.co.uk on its own website. 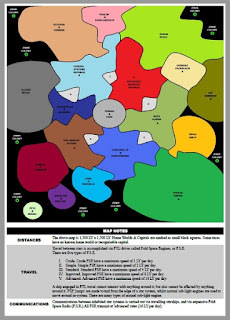 HOF Fire Team the grid based tech level alterable 15mm skirmish system wargame rules for science fiction are now a paid for digital download. 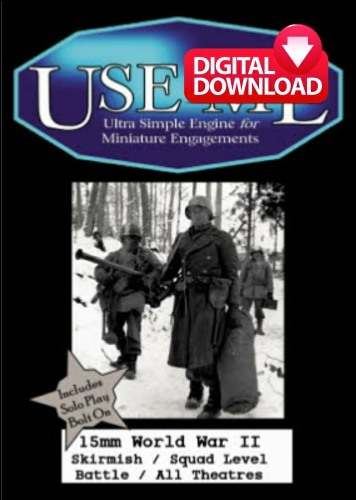 No longer in print it is excellent value containing the book, the book covers and a twenty page set of all the battle boards and scenic items on grids as well as a page of blank grids too. All for 8.00GBP. 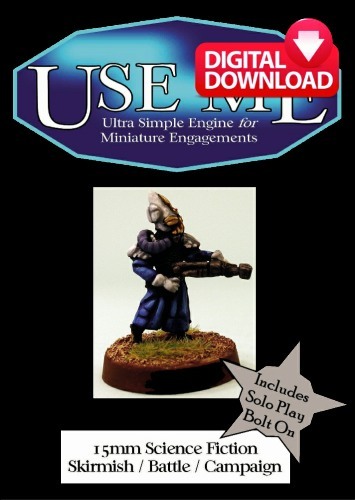 It works with any 15mm miniatures from present day to far future and contains generic generation rules as well as three backgrounds with stats. The Prydian Civil War, the Pan Galactic Empire and the teeming Argo cities of a near tomorrow. 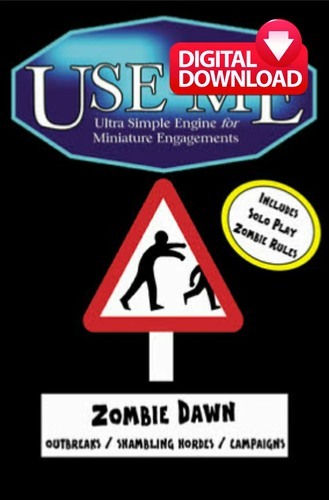 We will be releasing other titles out of print and in print as digital downloads in coming weeks including USEME and Alien Squad Leader 2.0 as well as Age of Might and Steel. Go HERE or read on for more. The process of purchasing a digital download from the website is straight forward and works as follows. 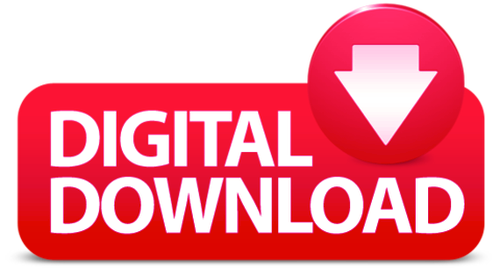 Any product which has the digital downloads sticker on it is purchased as normal into the shopping cart and then through to checkout. During checkout and once purchase is made your will get an order number and a receipt. If your order contains any digital downloads there will be a box displayed on the screen where your digital book will appear once it is loaded in (this can take a minute or so for large files) with a button to click to download it. 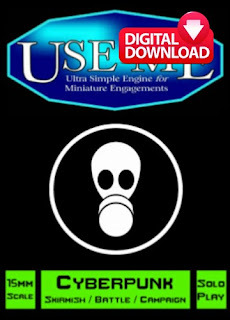 You will also get the download link in your email as well. The purchased download is now yours and can be downloaded up to five times. But do not worry for as long as you can email us your order number at any future date we will manually send you the files by link reply. If you have any questions just contact us by email on sales@15mm.co.uk. Read on for more information or go to our website HERE. HOF Fire-Team is an original dynamic tactical game with a setting from ultra modern to the far future. Fire Team pits squads of soldiers, guerrillas, police, and thieves or just about anyone else with a grudge against one another. 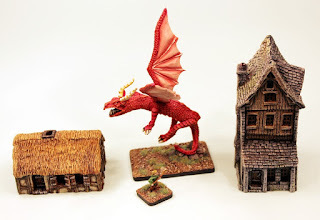 Use miniatures from your existing collection, on single bases, or add any new ones of your choice. Players command a number of Teams. 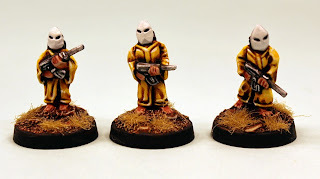 These being Fire Teams, Support Teams, Command Teams and trusting to sound small unit tactics and the luck of the dice they attempt to carry out their mission objectives. 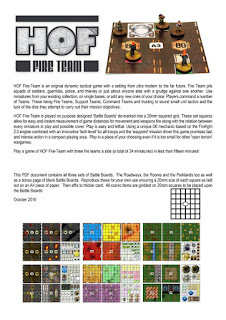 HOF Fire-Team is played on 'Battle Boards' de-marked into a 20mm squared grid. 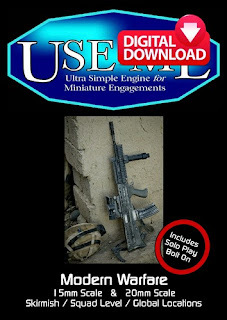 These set squares allow for easy and instant measurement of game distances for movement and weapons fire along with the relation between every miniature in play and possible cover. Play is easy and lethal. 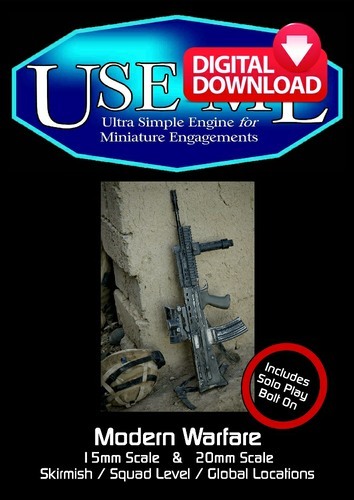 Using a unique D6 mechanic based on the Firefight 2.0 engine combined with an innovative 'tech level' for all troops and the 'waypoint' mission driver this game promises fast and intense action in a compact playing area. 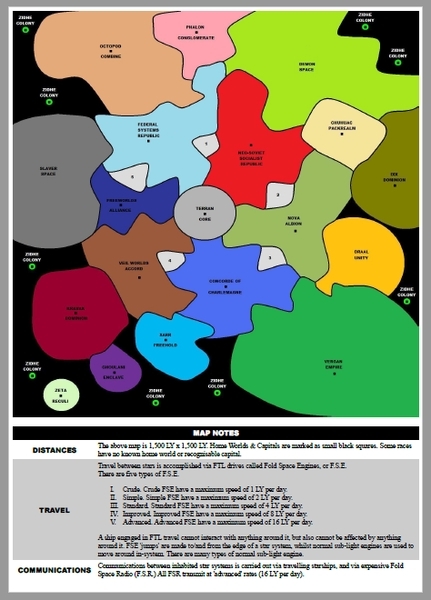 Play in a place of your choosing even if it is too small for other ‘open terrain’ wargames. 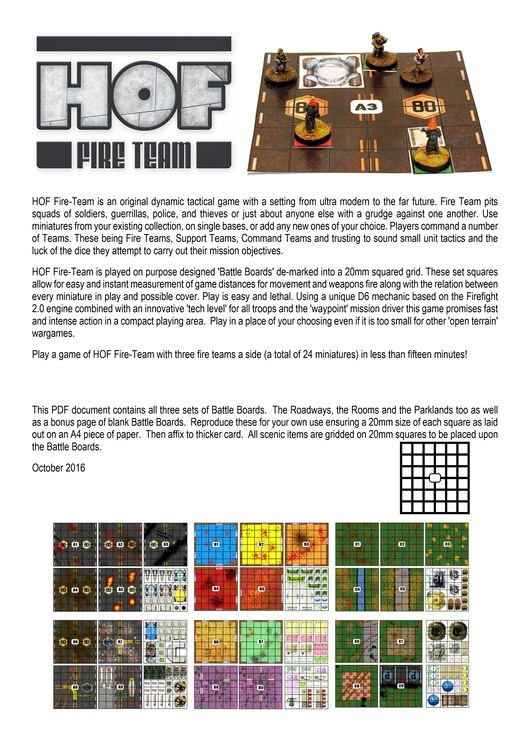 Play a game of HOF Fire-Team with three fire teams a side (a total of 24 miniatures) in less than fifteen minutes! If you are keen on learning more from four years ago there are reviews and interviews online for the book which are still perfectly valid. 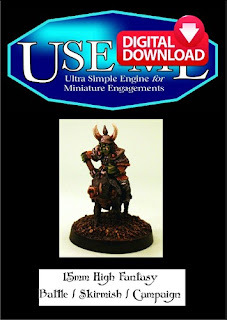 You can see a video review by the Voodoo Ork HERE and an in depth look HERE over at Dropship Horizon blog. I must point out that these pre-date by a year the new website www.theionage.com formerly of the HOF range. A google search will highlight more reviews and such for you. 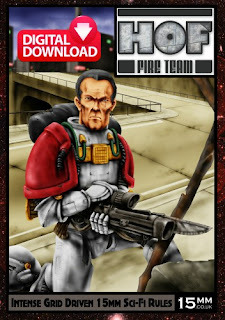 15mm.co.uk has a vast array of 15mm science fiction miniatures which you can use for HOF Fire Team. 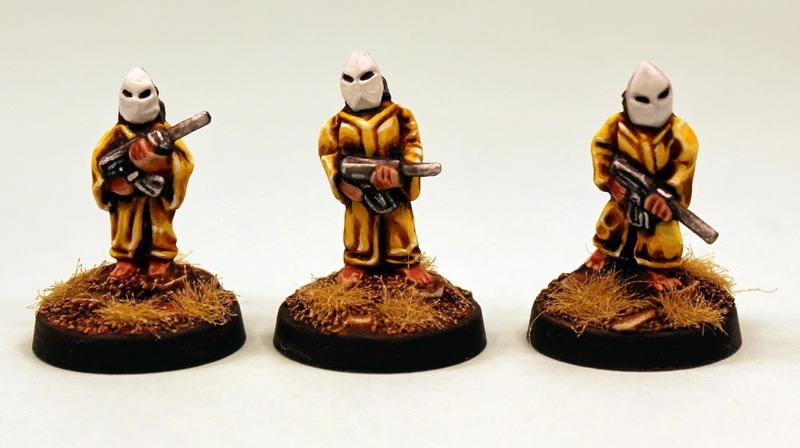 These include the huge HOF 15mm Science Fiction range which has Humans, Aliens, Robots and way more in it plus the Laserburn classic range and the Asgard range too. Click through to see each of these. Above is the Cultist Holy Guard. HOT37 Destroyer of Hope 15mm grand dragon returns! September was a great month for 15mm.co.uk and as we now turn towards the autumn (I think its autumn but no one in Scotland ever sees the sun so who knows!) we are re-releasing the last two codes of our resurrection of 15mm monsters back into the HOT 15mm Fantasy range. This is the HOT7 Giant and the HOT37 Destroyer of Hope grand dragon. Both are online now with 15% off until the end of this month. 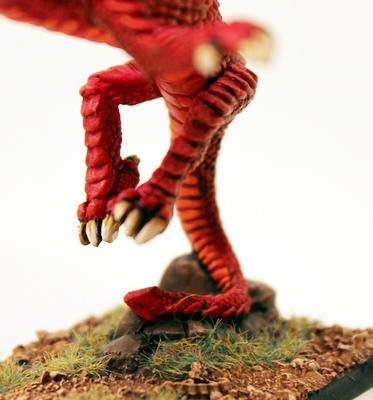 This time we focus upon the largest monster in the HOT range which has been out of production for over two years and is a superb centre piece for your army. Go HERE or read on. The mighty HOT37 Destroyer of Hope Grand Dragon which is by far the largest monster in the range and makes a superb centre piece. 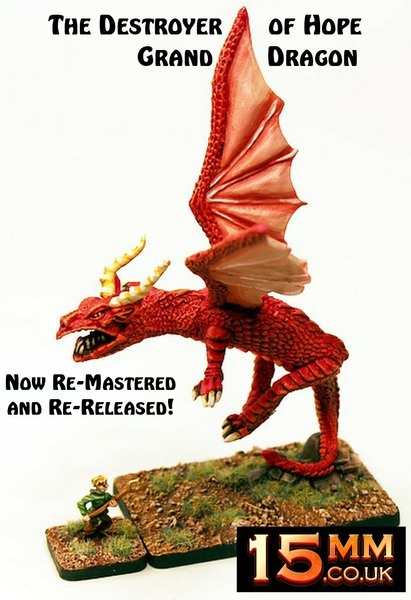 It is now a high quality grey tone resin kit and no longer white metal. We have also changed its name slightly it is now known as the 'Destroyer' rather than the 'Swallower' as it used to be known (we have made a few changes so it is, unlike the others, actually a new model). Breath fire and rain down destruction! Go HERE. 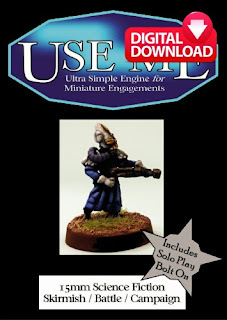 This pack contains one grey tone resin 15mm big monster kit supplied in seven pieces which are of a low level of complexity to assemble. When assembled the Destroyer of Hope stands rearing up from its rocky outcrop at 120mm from the rocks to the tip of its wings and 60mm to its mouth from the rocks. It is a grand dragon and towers over your enemies. 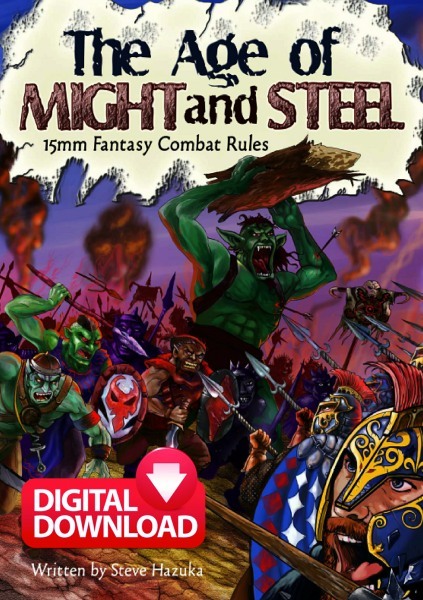 Suitable for use with many different armies it suits many different fantasy races. 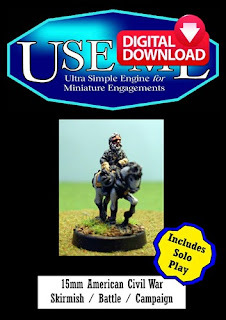 Supplied unpainted and unassembled and shown on a 40mm by 60mm base which is not included. Choose from one pack or three packs saving 10% off list price. 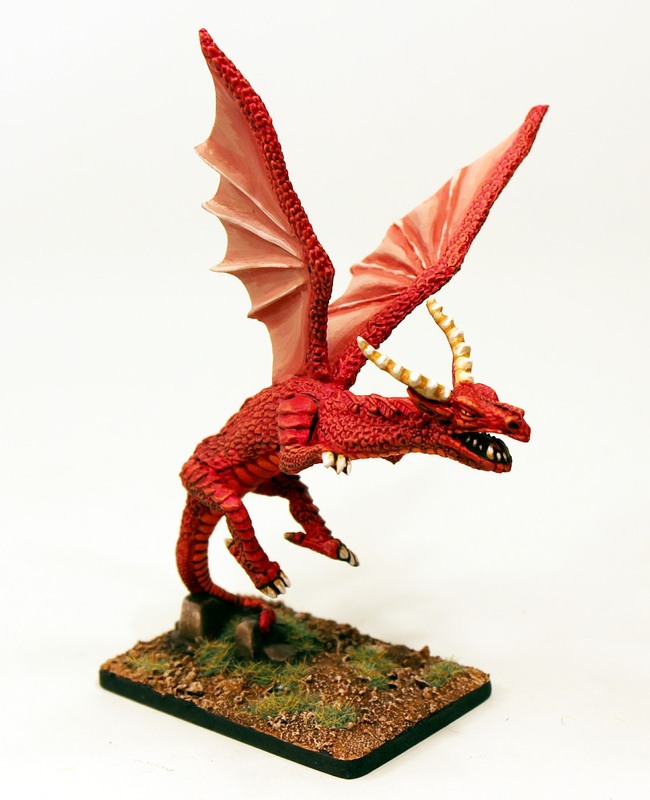 10.00GBP Here are some other pictures of this grand dragon shown with other miniatures and items from our ranges to give you a sense of its scale and use in 15mm wargaming. Go HERE. The mighty monsters. 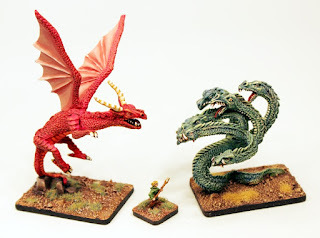 HOT37 next to a 15mm Human with HOT35 Giant Hydra! The HOT 15mm Fantasy Range contains other Dragons of vary size and use and price points and all of them are different. 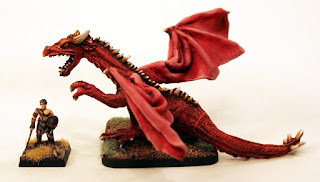 These include HOT23 Sitting Dragon which rests preening itself, HOT26 Flying Dragon which is a two part model in flight and HOT34 Wyvern which is a popular medium size flying monster. We have the Undead nasty HOT100 Ghoul Dragon too. 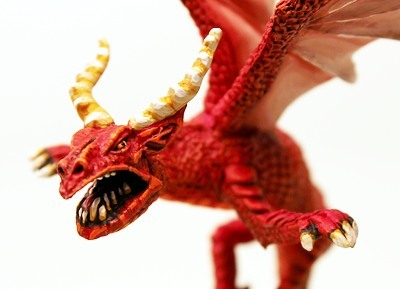 There is also the classic and truly ferocious P11 Old English Dragon which is among our largest and most complex white metal kits. You can see P11 below. Click on the links to visit the page on our website. As I outlined at the head of this article we have two re-releases this month on special offer. We will have a bulletin later this month about HOT7 Giant a perennial favourite in the range but it is online now if you wish to place your order sooner.